Since Valencia was selected as the host city of the 32nd America's Cup; the Consorcio Valencia 2007 assumes the main task of reshaping the port of Valencia to make it the best scenario for the sailing event. The result of this reorganization is La Marina Real Juan Carlos I, a large space in which there are meeting places for the public and recreational spaces where in the future can be combinated cultural, sport and leisure activities. La Marina Real is located in the heart of Valencia, north of the commercial port and along the beach Malvarrosa where along the promenade there are numerous restaurants, bars and nightclubs. Veles e Vents is a building in minimalist style with a surface area of ten thousand square meters, consisting of horizontal platforms that create shade for the terraces where the spectators and guests for the America's Cup will be situated. 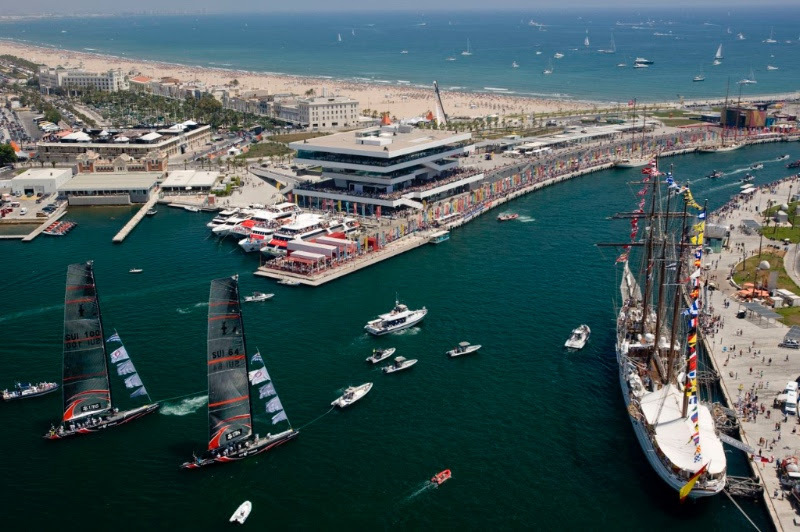 The building stands on the canal of Port America's Cup and acts as a visual connection between the Mediterranean and the city of Valencia. All teams participating in the America's Cup sail have past it in their ships every day and any of its four floors give a splendid view over the whole port. David Chipperfield explained that his intention was to create a building that was "exciting, where people could meet to enjoy the America's Cup, so the idea that the design could create shade was important, so that spectators were as comfortable outside as they were inside". Veles e Vents Today: The space for exhibitions and events will be located on the entrance floor of the building where a full program of different events is expected each month, many of which will be free entry. Here you can see and enjoy six annual exhibitions of photography, sculpture, digital art related to new media, as well as theater, dance and even micro-theater shows. Various ramps connect these platforms with the lowest walk, consisting of the final connection of La Marina with Malvarrosa beach. An outdoor area also hosts many international restaurants and offers various entertainment venues. The building is located opposite the main entrance from the beach in La Marina and is the ideal setting for any type of event.